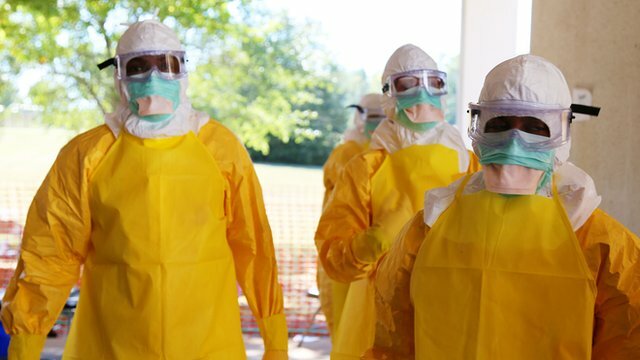 The first batch of an experimental vaccine against Ebola is on its way to Liberia. The shipment will be the first potentially preventative medicine to reach one of the hardest hit countries. But experts say that, with Ebola cases falling, it may be difficult to establish whether the jab offers any protection against the virus. It has been produced by British company GlaxoSmithKline (GSK) and the US National Institutes of Health. GSK said a plane carrying some 300 initial doses of the vaccine was expected to arrive in Monrovia on Friday. And the company hopes the first volunteer will be immunised in the next few weeks. The chief executive of GSK, Sir Andrew Witty, said the pace of development was almost unparalleled and was comparable to only the development of a pandemic flu vaccine or new medicines for HIV. He told the BBC: "As an example we have delayed two other vaccine development programmes to free up the space to do this work, so this has come with a significant amount of disruption." Scientists aim to involve 30,000 volunteers in the trial in total, including frontline health workers. If all regulations are met, 10,000 volunteers will be given the GSK vaccine. A matching number will get a placebo, dummy vaccine. And there are plans for a further 10,000 people to get a separate experimental jab. The results will be compared to see if either vaccine offers any meaningful protection against the virus. A version of the vaccine has already been tested on 200 healthy volunteers across the UK, US, Switzerland and Mali. GSK says it has been found to have an acceptable safety profile so far. But it is only in affected countries that experts can determine whether it provides adequate protection against the virus. Dr Moncef Slaoui, of GlaxoSmithKline said: "Shipping the vaccine today is a major achievement and shows that we remain on track with the accelerated development of our candidate Ebola vaccine. "The initial phase one data we have seen are encouraging and give us confidence to progress to the next phases of clinical testing." The company stresses the vaccine is still in development and the World Health Organization, and other regulators, would have to be satisfied the vaccine is both safe and effective before any mass immunisation campaigns could be considered. Field trials of other promising vaccines - for example one involving the company Merck - are planned in Guinea, Liberia and Sierra Leone in the months to come. And there are reports that a trial of an experimental drug called Zmapp might start in the next few weeks. However, experts say with the number of Ebola cases falling opportunities to test vaccines and drugs could be limited. Prof Jonathan Ball, a virus expert based at Nottingham University, told the BBC: "Because case numbers are starting to come down it will become harder and harder to show if the vaccine is having any impact. "Ultimately we may be in position in a few months time where we don't know whether this vaccine is effective in humans. "But it is important to get answers if we can - if not for this outbreak, for future outbreaks. We need to be prepared."